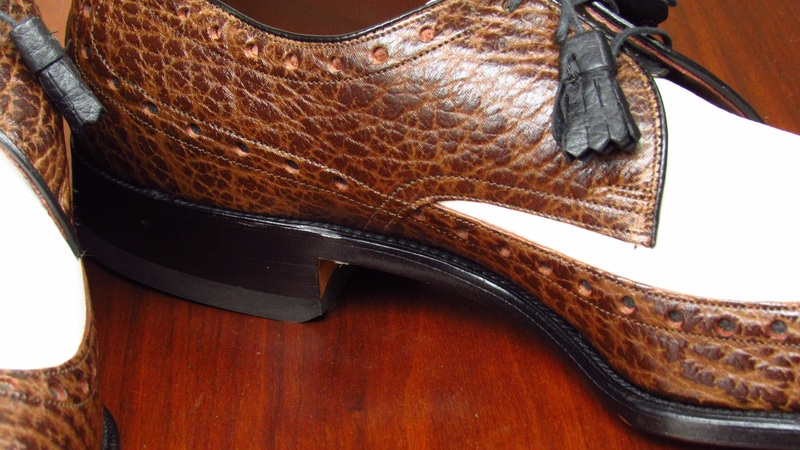 This pair is identical to my other shell cordovan long wings pair but they have a rubber heel. I can use them as bad weather beaters. When there is bad weather. Which isn’t often. Since I live in a desert. But your friends and family aren’t buying these justifications anymore. They are making comments. And maybe you feel like I am somewhat to blame me for all of this. And you are thinking about sending me a blame email. But let me just say that you are responsible for own purchases. I did not force you to buy anything. In fact, I blame you. If you didn’t read the blog, I probably wouldn’t be buying these shoes to blog about. So I am being wrongly accused. Like Dr. Richard Kimble. I am the actual victim here. A shoe victim. I should pity myself but I don’t. This pair is one I can definitely blame on you. I bought them specifically to blog about. It’s a pair of Allen Edmonds shark skin spectators that I found on eBay a while back. I rank this pair as the most unwearable pair of shoes Allen Edmonds has produced. 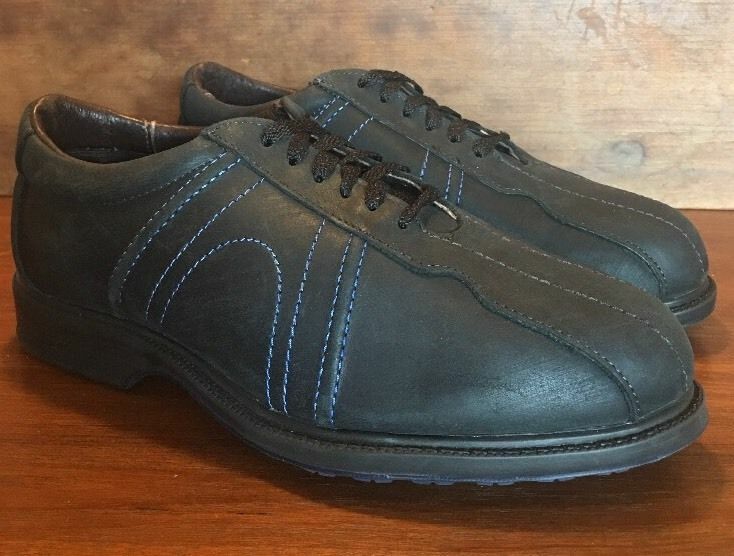 Not the ugliest, which of course are these Jack Nicholas golf shoes, but a pair that is unsuitable for any activity. Feel free to disagree with me. What event is appropriate for a pair of shark skin spectators? Office – No. Business meeting – No. Sports – No. Holiday party – No. Maybe the key is in the name of the model, Nassau. Linen pants with a Mai Tai in my hands on a Bahamas beach resort? But they seem a too heavy any tropical environment. 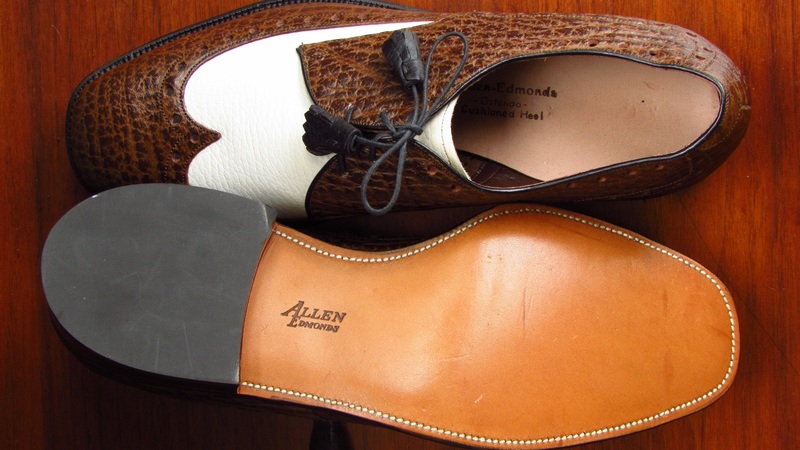 I went through a number of old Allen Edmonds catalogs and found that the company started producing shark skin shoes in 1964 with the first model being cleverly named the “Sharkey”. According to the catalogs, the Nassau was introduced in 1970 and ran through 1988. In 1974, the brown model was priced at $70 which is about $400 USD today. It primarily came in brown or black but I never found this spectator model (8541) in any catalog, so it could have been a special order. 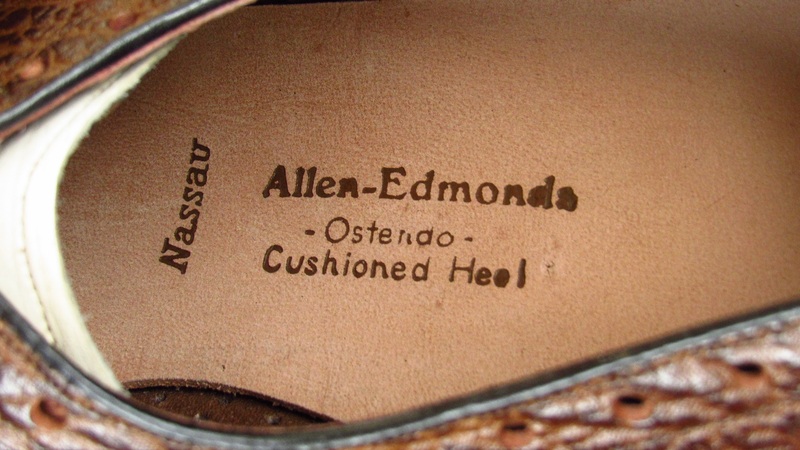 The shoes use a last that Allen Edmonds doesn’t list anymore on their web site. It’s been called the “Ethan” or “Ivanhoe” last. Other references have it as the “728 Last”. 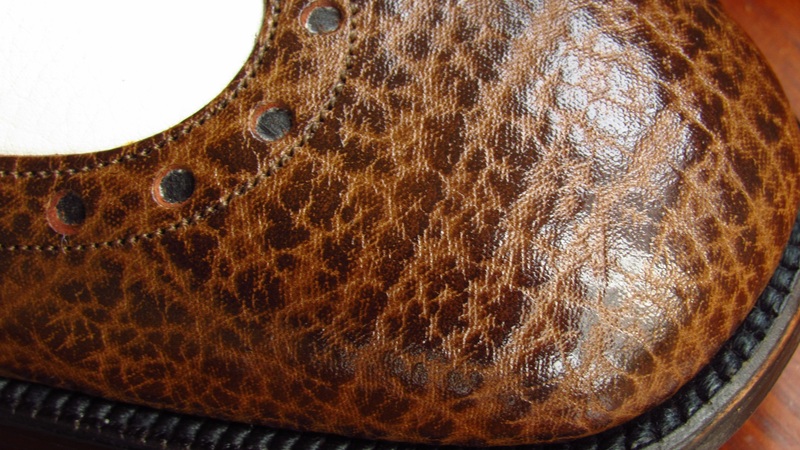 The front of the shoe is bullnosed and the sole has a spade-like shape. 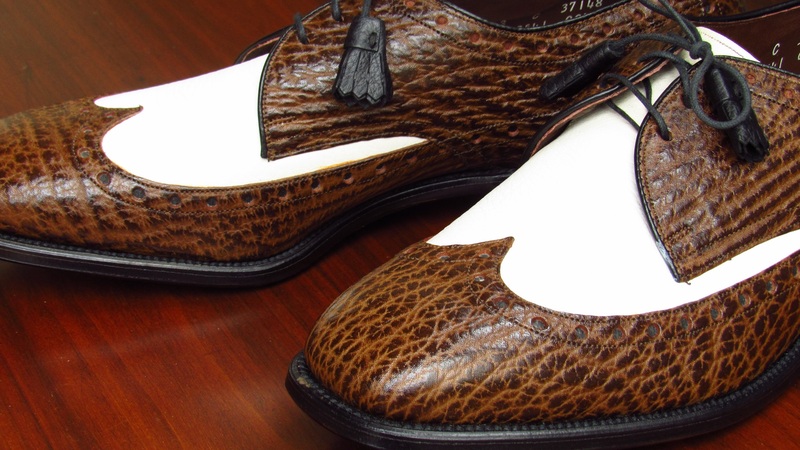 Exotic leather dress shoes were fairly popular in the 1970s. 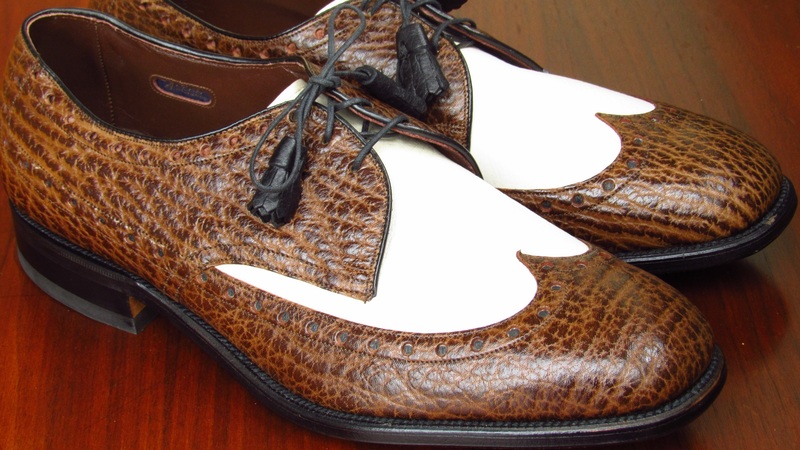 Allen Edmonds and Footjoy were the primary USA manufacturers of exotic dress shoes. Dacks in Canada made quite a few models as well. 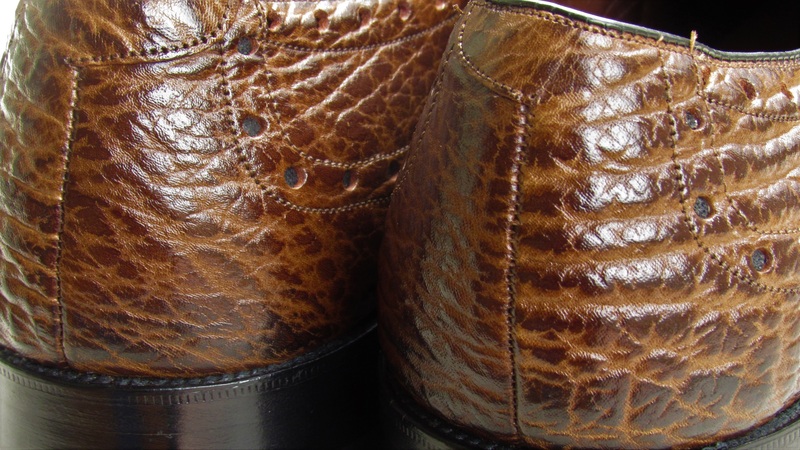 I have also seen a few Florsheim and Nettleton pairs but they are rare. 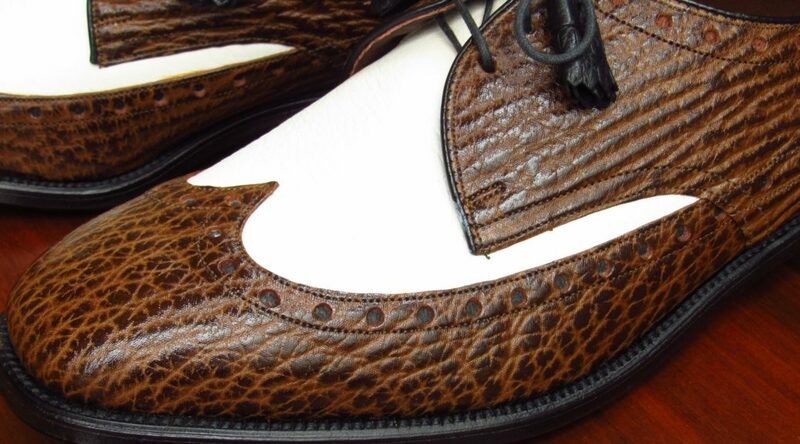 I did an online search and couldn’t find any dress shoe manufacturer selling shark skin shoes currently. There were a few high-end cowboy boots using the leather. 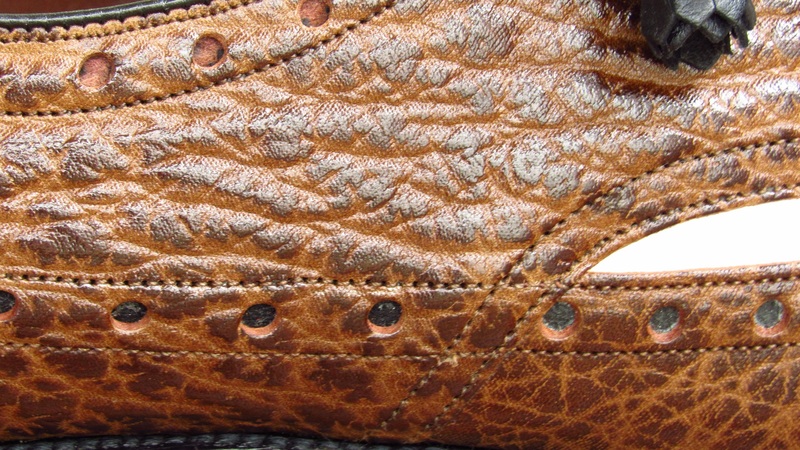 So the leather is no longer popular with consumers. It isn’t illegal to manufacture either in case you were wondering. 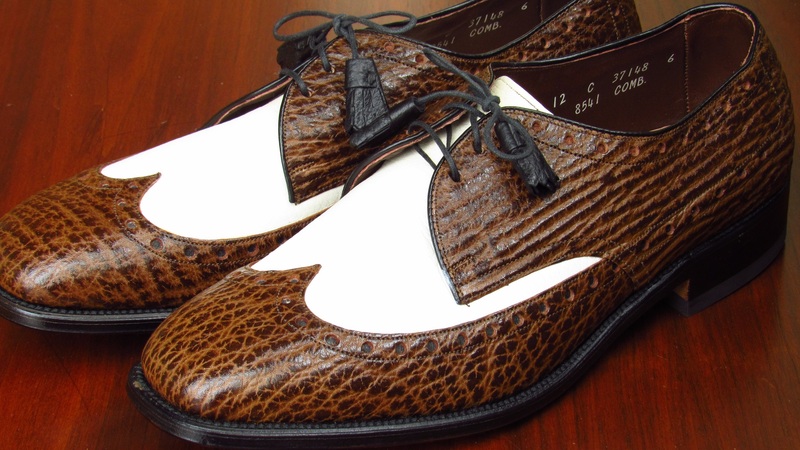 I do like spectator shoes (without the shark skin), but I have a hard time actually wearing them. Maybe you can pull off spectator shoes, but I can’t. I look like a clown. Not a scary clown. Or a sad one. Sort of a silly clown. A clown who wears dark wash jeans and a button-down oxford shirt. And since La-La Land came out, spectators make you look like a Ryan Gosling wanna be. Obviously, Allen Edmonds didn’t make this pair for me but someone bought them. He went into a store and said these are the ones for me. Then he had second thoughts and never wore them. Now they have been sitting in my basement museum for a year or so. In a box. Useless. Maybe I shouldn’t worry about being fashionable and just wear them. I could be “that” guy. And we (you and I), also shouldn’t worry about our shoe purchases. They are justified. Instead of blame, we’ll move forward and embrace our “hobby”. Thanks for the write-up. I also seem to stalk ebay for Spectators but often wonder where/when I would wear a pair. My schedule isn’t exactly burdened with horse shows, garden parties, and polo or cricket matches. Perhaps an open-air summer classical music concert. Alas, for me, having a practical use has rarely been the primary motivation for a vintage shoe purchase. Agreed. Vintage shoes are not practical unless you make yourself believe they are practical. Which I have done. Hey, thanks for the shout out! But I also wore them the other day when it was not raining….so there. Then you need a pair. And a scruffy beard. And Emma Stone. How do you know Ryan Gosling isn’t trying to look like me? Huh? Personally, I think those things look great! I’m not generally a fan of shark leather, but I think that is mainly because it is generally in dark blues and black – the brown looks really good! Then you need a pair too. And post photos of you wearing them. At your Long Island estate. If only these were a 12 D.
I finally found a pair of Spectators, used on Ebay, in my hard to find size. I was ready to pay $150, because I may never see my size again. My concern was also where to wear them. Your clown explanation really says it all and shows me it’s not just me. Thanks to you my answer is buy when the price gets low enough and I’ll know it when we get there. Your article tells me that their are large numbers of “like new” Spectators in closets that will show up on Ebay in the years to come. Did you ever wear them? How do the shark Nassau’s fit? TTS? I have tried them on but never found that special occasion required those shoes. The shoes measure a bit short in length and that’s how they felt. But trying them on is not the same as wearing them all day. My grandfather has a pair of these as well as 50+ other pairs from the 1950’s moving through now. Any suggestions on where to best sell the collection or shoes individually?? I have no idea where to start!